"This casserole can be changed by varying the herbs used to flavor it." Preheat oven to 350 degrees F (175 degrees C). Lightly grease one 9x13 inch baking dish. Mix the diced bread, onion, salt and herbs together. Combine the soup with milk, stirring until creamy. In the bottom of the prepared dish, layer half of the fish, half of the bread mixture and half of the soup mixture. Repeat layers and cover top with cracker crumbs and dot with butter. Bake uncovered in a preheated oven for 1 hour or until fish is flaky with a fork. Tilapia filets star in this award-winning enchilada casserole. Made this for ladies luncheon. Substituted cod for haddock. Very easy, would add a litttle more seasonings next time. Guestes all loved it. Also husband enjoyed leftovers. I thought it was pretty pasty with all of those breadcrumbs in the layers...I would not recommend wasting fish to make this recipe. Maybe just use the soup, but leave out the breadcrumb part. 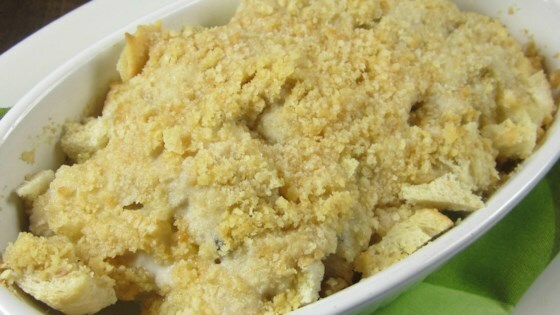 This casserole is great! It is the only way I can get my family to eat fish. Excellent. The family loved it. No leftovers either! I thought this was excellent. I follwed the recipe exactly. It was awesome. Will definitely make it again!